Do you want to make extra money on the side but feel like you don’t have the time? If this sounds like you, one way to find time is to make money on your lunch break. Your lunch break can be a great time to relax and refuel. It can also be a good time to make extra money. When I side hustled in the past, my lunch break was prime time for me. Since I had goals to pay off debt and stash away as much savings as possible, I used my lunch break strategically to build my side business. Even if you’re not interested in launching a side business, you can still use your lunch break to be productive and make money on the side. You may think it’s impossible to make extra money during lunch. Yes, it is a time to recharge. But when you manage your time wisely, it’s a great time to make extra money – either at your desk or near your office. Or both! 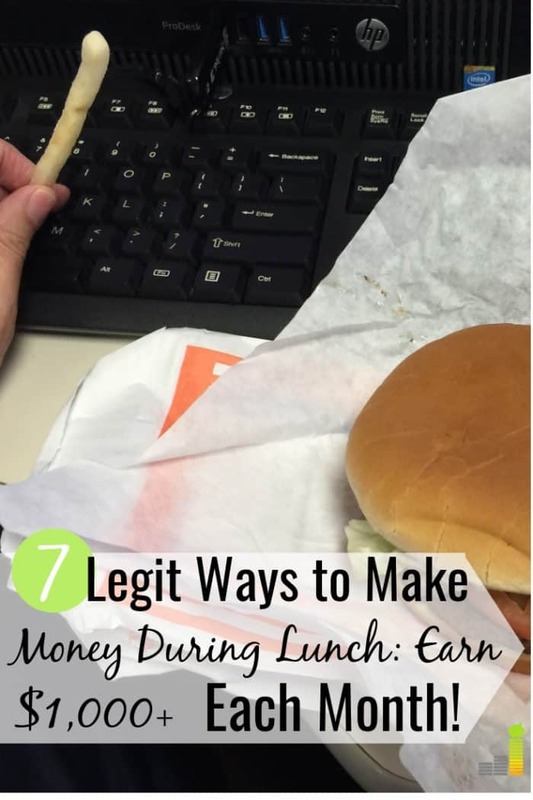 Here are seven legit ways to make money on your lunch break to help pad your budget. If you don’t know where or how to start making money on your lunch break, taking surveys online is a great launching pad. Taking surveys is one of the easiest ways to get paid for your opinion. You won’t become rich taking surveys, but they can be a good way to earn extra income. In many cases, you can even redeem points for free gift cards if you’d rather not have the cash. Survey Junkie: This is our top survey site since they pay you cash straight to PayPal or let you redeem rewards for Amazon gift cards and other retailers. Survey Junkie began in 2005 and has over 3 million members. You can start redeeming cash once you hit the 1,000 point mark, which is equivalent to $10. Pinecone Research: This site pays $3 per survey and you can choose between PayPal, Amazon, or restaurant gift cards for payment. They also pay you to do product testing. Pinecone has no minimum redemption level so you can redeem any time you wish. The Harris Poll: The Harris Poll has been around for over 50 years and is best known for their political polling. They also conduct surveys on a variety of other topics, and you can join focus groups to earn points even if you don’t qualify for a survey. Many survey sites are mobile friendly so you can take them right from your phone. It’s best to sign up for a few different sites to increase your opportunities. Mystery shopping is a fun way to make extra money when you have little time. Generally, you can register online as a mystery shopper and can choose from a variety of assignments in your area. As a mystery shopper, you go to a business or store and interact with the staff as a normal customer. Sometimes that involves asking questions about their products or services or purchasing something. Don’t worry about the purchases – you’re reimbursed for those. After your experience, you send a report and receive payment. Some mystery shops are fun since you can try new restaurants or services you are genuinely interested in trying. I know someone who always gets free oil changes because they work as a mystery shopper and report on different auto shops. I tried mystery shopping a few years ago and got to tour a nice gym as part of the assignment. It’s interesting because there are so many unique opportunities. You can even mystery shop during your lunch break as long as you choose assignments near your job. Jobs2Shop is a great option for mystery shopping. They pay you to visit local retailers to make a purchase or test a product. Jobs2Shop pays up to $85 per shop, so this can be a good way to make money on the side. Instead of browsing Facebook during your lunch break, you can use other apps to make money. Swagbucks is a loyalty rewards site that pays you for completing a variety of tasks. You earn points for completing each task and those points can be redeemed for gift cards or cash via PayPal. Check out our Swagbucks review to learn more about how the platform works. Inbox Dollars is very similar to Swagbucks and allows you to earn money reading emails, watching videos, and trying out offers. You can earn $5 instantly when you sign up and all you need is $10 in your account to cash out your payment. Another app you can try is Shopkick. If you like to stop by stores during your lunch break, download the Shopkick app so you can earn points for simply walking into different stores and scanning barcodes. Shopkick is available on iOS and Android. With Shopkick, you earn points, also known as ‘kicks’, for doing simple tasks like scanning barcodes for different items in stores along with browsing products online and making actual purchases. The points you earn can be redeemed for gift cards. Have any old items lying around the house that you no longer want or use? Consider selling them online for extra cash. You can use sites like eBay and Amazon to set up a seller profile. If you’re looking for local sales, you can use Craigslist or the Facebook Marketplace. Once you sell your old stuff, you can start a side business flipping items you find at thrift stores or resale shops and selling them online for profit. If you’re crafty or want to sell items via dropshipping, you can set up a Shopify store. Check out our Shopify review to learn more about how to do this. I have a friend who sells items online and he makes an extra $500 to $1,000 per month on average. During your lunch break, you can check on your listings, answer questions from potential buyers, or work on your store. Freelancing is how I made extra money on my lunch break. If you work in an office or have access to a computer, you can work on selling some of your freelance skills during your break. You can offer graphic design services, do virtual assistant work, proofread content, or write articles. When I had a day job, I did a lot of freelance writing to make money online during my lunch break, I’d usually use the time to outline articles or finish a first draft. This helped me out because I often had less work to do once I got home in the evening. Blogging requires a lot of work upfront. However, it can be a lucrative way to make money online once you gain some traction. If you’re trying to grow a blog, you can use your lunch break as extra time to plan your content, promote blog posts, do outreach, respond to comments, and update your site. There are many different ways to monetize a blog ranging from display advertising to affiliate marketing, sponsored posts, and selling products or services. Try to focus on one monetization method at a time so as not to overwhelm yourself and prioritize your schedule. Determine how much time you have to blog per week and break that down to a daily goal. Using the time allotted in your lunch break can actually do wonders. If you’re thinking about starting a blog, here’s a tutorial to help you get set up. Word of mouth reviews still go a long way – so much so that some companies will pay you to write honest reviews on different products or services. If you already use a particular item and like it, it shouldn’t take much time to write a review for extra cash. Review Stream is a site that will pay you to write reviews on nearly any product. They pay via PayPal, and keep in mind that they tend to pay more for in-depth reviews on in-demand products that meet their guidelines. Software Judge pays you up to $50 for honest reviews on digital software products you use. CrowdTap will pay you to answer questions and review everyday products. You may not like the idea of using your lunch break to make money on the side. It is a time to relax and reenergize for the afternoon. However, if you want or need extra income, there are ways to make money on your lunch break that are relatively simple. Even if your lunch break is short, you can still optimize the time you have to make extra money. Whether you’re looking to grow a side business or complete a few short tasks to make extra cash, these ideas will help you put more money in your pocket and free up time before and after work for other tasks. 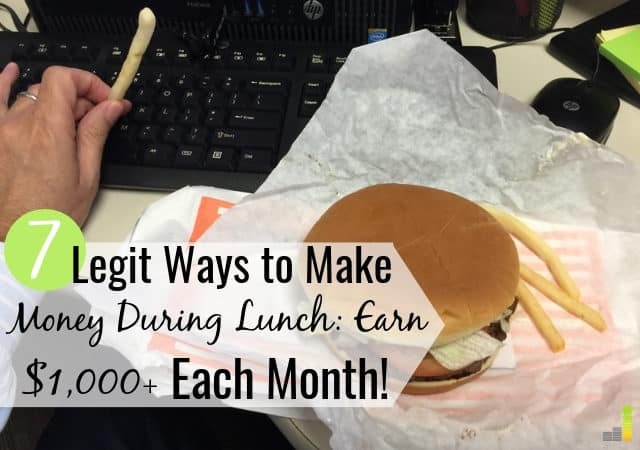 Have you ever tried making extra money on your lunch break? What’s your favorite way to make money on the side? How do you find free time to make extra money?